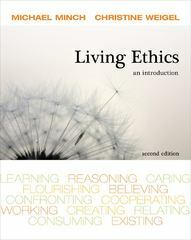 Living Ethics 2 Edition Minch and Weigel's unique LIVING ETHICS casts a wide net, including traditional works of philosophy along with a diverse collection of voices from literature, science, popular music, and continental philosophy. Each chapter focuses on action, addressing an issue in the range of basic human activities like flourishing, believing, caring, consuming and nine other topics. The text approaches the study of ethics as a set of personal and provocative questions that have ethical significance for students' lives. This wide-ranging anthology, distinguished by its interdisciplinary selections, provides a comprehensive approach without separating theory from applied ethics. The book's breadth of readings integrates feminist and multicultural viewpoints for a broader range of perspectives and genres than any other text in this field. By highlighting contemporary issues and multiple disciplines, LIVING ETHICS will engage readers with little or no experience in philosophy.